In her important book, Best of All: the quick reference guide to effective volunteer involvement, Linda Graff examines many topics sometimes glossed over by others. One of these is setting boundaries and here are some excerpts of her useful advice. Leaders of Volunteers: Will You "Be the Voice" for Our Profession? The theme of International Volunteer Managers Day 2017 (November 5) is "Be the Voice!" What does this call to action mean and how can each of us speak out effectively on behalf of our profession and the volunteers we lead? Consider what you "say" in actions as well as words. And prepare to celebrate IVMDay! Read this Month's Hot Topic. We'll also be linking all month to what other volunteerism bloggers post on the IVMDay theme. Keep checking in - and add your thoughts, too! Can You Make the Case for Why Invest in Volunteer Engagement? Have you heard colleagues say: "It's just not possible to get funders to give money to support volunteer management"? Do you think that's true? Actually, the sad fact is that very few organizations submit proposals requesting funds for engaging volunteers - partly because they do not know how to "make the case" effectively. Help has arrived! With a big thank-you to The Leighty Foundation, there is now a "Why Invest in Volunteer Engagement?" Web site that speaks directly to funders, educating them on why money is needed to expand effective volunteer efforts, tying this to the overall goals of achieving an organization's mission. Click on the "Volunteer Engagement" tab in the navigation bar and you'll find sections with strategies for funders and for organizations, plus you can download a free, 20-page booklet to print out and share widely: The Funder's Guide to Investing in Volunteer Engagement. Thank you to Jane Justis Leighty for her advocacy for our profession and for the volunteers we lead. You can read more about the effort to bring funders and nonprofit leaders together in the new e-Volunteerism article by Beth Steinhorn. The "new breed" of leaders of volunteers will jump at the chance to download our latest e-book addition to the Energize Online Bookstore. Check out The New Breed, Second Edition by Jonathan McKee and Thomas Mckee on any electronic device (learn more here), and learn the wants and needs today's "new breed" of volunteers, especially those who don't respond to old management styles. Jonathan McKee and Thomas McKee have tapped into their decades of experience with the simple goal of helping you recruit, manage, and lead today's volunteers. They'll guide you to a clearer understanding of what volunteers look like now, how they want to get involved, and how you can most effectively attract, train, and unleash them within your organization. The Evolution of International Volunteer Managers Day (XV, 1 Oct. 2014) - IVMDay acknowledges the people who lead volunteers, salutes them for their essential role in creating dynamic volunteer opportunities, and works to raise the profile of the volunteer management profession. But just how did it all begin in 1999? What mechanisms have kept the show rolling and what might the future hold? Andy Fryar and members of the IVMDay Committee review the evolution of this growing annual event. Passion, Not Mimicry - At a UK conference in 2007, Rob Jackson heard discussion of: What are the significant issues facing volunteer managers today? And when the answers in a similar event ten years later mimicked the exact same responses, Jackson's heart sank. Jackson and co-author Susan J. Ellis write, "it seems as if our profession is still stuck at the same stage of development. How are we ever going to succeed if we cannot collectively overcome the challenges that continue to dog us in our field?" In this Points of View, Jackson and Ellis suggest a simple path toward change: Steer clear of the choice to mimic what others are doing and instead develop and follow a passion for volunteer management work by refocusing on its purpose and promise. Making the Case to Funders to Invest in Volunteer Engagement - A special track at the National Summit on Volunteer Engagement Leadership this July convened a group of funders (foundations and other donors) who met with volunteer resources managers and other nonprofit organization leaders. The purpose? To discuss the challenges of funding volunteer engagement efforts. Beth Steinhorn, one of the track's leaders, excerpts and consolidates tips and strategies discussed to help non-profits make the case to funders: investing in volunteer engagement is beneficial. 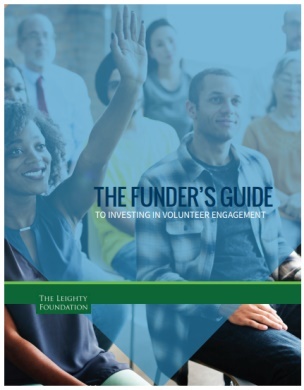 Get the link to the free "Guide to Funders" now available on the Leighty Foundation website. What unique factors should adults consider when working with young volunteers - factors that set teens apart from others? Using the successful 4-H Youth Experiences in Science Project as a case study, Part 2 of last issue's Training Designs by Marianne Bird and Sue Manglallan explores how to train adults to work successfully with teenage volunteers. e-Volunteerism S tarts Its 18th Volume Year! The next issue of e-Volunteerism, launching on October 15th, marks the beginning of Volume XVIII. Great articles are in process for this issue, including: a Points of View dialogue on an experiment in Italy offering volunteer work to north African asylum seekers as they await confirmation of their immigration status; reflections on what makes "volunteer management" different in a church congregation (by a vicar who was once a professional volunteer manager); resources to help you develop strong volunteer handbooks; a report on the ways in which volunteers are engaged in meeting the United Nations' Sustainable Development Goals; a consideration of ethics in working with volunteers; and more. As always, the articles from all past issues remain available in the journal Archives . Did you know we have created a playlist of YouTube videos to use as you learn more about leading volunteers? Here's a funny sample. Visit our YouTube playlist to see this video and more that we have collect for you. Feel free to share! Identify in position descriptions, and reinforce through orientation and training sessions the limitations of the position and the kinds of responsibilities volunteers should and should not take on. Help volunteers to understand the implications (for clients, themselves, the organization, its reputation) of boundary breaches. Provide examples of prohibited activities and help volunteers to identify situations in which they may be tempted to exceed position duties or cross relationship boundaries. Pay particular attention to boundary issues where volunteers connect directly and/or repeatedly with patients/clients or event participants, especially if the people being served are in any way vulnerable or isolated. Clearly describe what on-duty relationships should look like, including appropriate and inappropriate ways of relating to clients, supervisors, board members, employees, and peers. Clearly communicate whether off-duty contact and/or relationships is (are) acceptable with any of the people the volunteer has met through their volunteer work. The value in this approach is that if you can convey the underlying principles to volunteers, they will be better able to identify for themselves the kinds of behaviors that are out of bounds, and you do not have to think of every possible thing that volunteers ought not to do. Think of these principles as boundary "tests." Instruct your volunteers to put their potential behavior to these tests when they find themselves being uncertain as to whether to proceed and when there is no one immediately available to help them decide what to do. Quick Tips come from Susan J. Ellis, President of Energize, Inc.